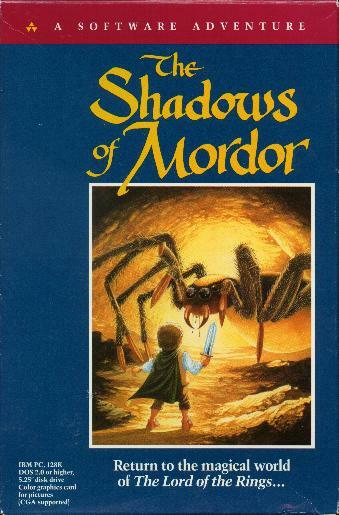 Shadows of Mordor, the third Lord of the Rings game by Melbourne House / Addison-Wesley, was published in both Europe and the United States under the same title. The U.S. version comes in the dark blue box shown above (colored boxes were the Addison-Wesley standard at the time). Since this game was published a number of years after The Hobbit and Fellowship, I don't believe an earlier tan Shadows package exists, as is the case with the first two games.